Former Host Andrea Tantaros: Fox Has A Culture Of Misogyny And They'll Destroy You If You Complain - Joe.My.God. “Fox News has plenty of money, they’ve bought off a lot of women. What they don’t have is accountability,” Tantaros alleged this morning in the exclusive appearance to explain her speaking out. Her comments and television appearance are likely to bring renewed scrutiny to the accusations, which Fox News and its deposed chief, Roger Ailes, had hoped to put behind them. Both parties have denied wrongdoing. Tantaros told “GMA” today that “Ailes sexually harassed me numerous times. 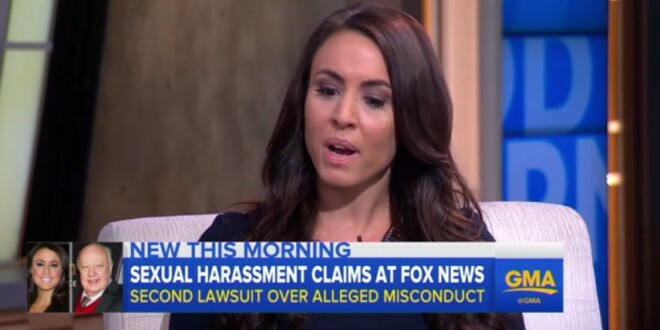 I was walking to a taping once and just said simply hello to him, and he said, ‘We need to get you a tighter dress.’” Tantaros today reiterated a claim made in her lawsuit that Fox News used the publication of her book to attempt to silence her.